Last May a high concentration of low strings aggregated in front of a chapel at the local Catholic school. Before officials could get a handle on it they performed the metal classic, “Pain and Pleasure”–once for unsuspecting onlookers and again by popular demand. Here is the first take. Cellos fiddling. Chiddling. Beren and Cirdan represented FAYC at the Far North Fiddle Fest a couple of weeks ago and learned this great tune from Tristan Clarridge of the Bee Eaters. 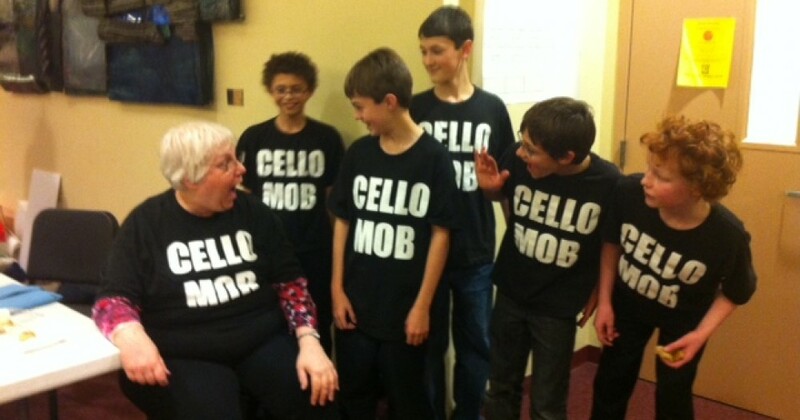 Hope to see more cellists there next year! Sunday, May 5, 2013, at 2:30 PM, the Fairbanks Cello Choir will be performing at Zion Lutheran Church, 2982 Davis Road. Tarantella from becca levey on Vimeo. FAYC cellists played this piece in a choir at Fairbanks Suzuki Institute.